We are so glad that you have chosen to worship with us this evening. We invite you to join in on the bold print in the bulletin. The restrooms are out the back door of the sanctuary to the right, as is the nursery in case your little one needs a walkabout. Don’t be afraid to ask questions, and please remember to mute your devices during worship. RESPONSE: Lord, have mercy. Christ, have mercy. Lord, have mercy. The star is dimmed that lately shown. Tis midnight in the garden now. The Savior wrestles lone with fears. Heeds not the Savior’s grief and tears. Is borne the song that angels know. That gently soothe the Savior’s woe. And so, Lord Jesus, we come to Your table, confessing the darkness within us. We come simply because You are merciful, and You have filled our hearts with Light. We come to eat this bread and to drink this cup, that we might be changed. Let Your Presence, which fills us through this meal, cast out all shadows, and keep us in Your light forever. Amen. 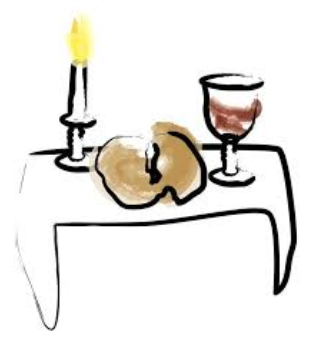 You are invited to come forward to receive communion by taking a piece of the bread, dipping it in the cup and eating it. Please know that all of our bread is gluten-free and our cup contains simple grape juice because we don’t want anyone to be turned away for any reason. Once you have received communion you may quietly leave the sanctuary.